Nestled in a mountain valley at the confluence of the Mekong and Nam Khan Rivers is the enchanting World Heritage town and former royal capital of Luang Prabang. It is a magical and captivating place with stunning colonial architecture, ornate monasteries and colourful markets. Rise early to witness the ancient dawn ritual of saffron robed monks collecting alms, discover the hundreds of Buddha sculptures in Pak Ou Caves, see the spectacular Kuang Si Waterfall and climb Phou Si hill to watch the sun sink slowly behind the Mekong River. Our “Simply” itineraries are perfect add-ons to your holiday. Discuss options with our Asia Travel Experts. Meet your guide on arrival, transfer and check-in to your hotel. During the drive your guide will provide an introduction to Luang Prabang, answer any questions you have, and make arrangements for the following day. Enjoy free time for the remainder of the first day. Nestled in a mountain valley at the confluence of the Mekong and Nam Khan Rivers is the enchanting World Heritage town and former royal capital of Luang Prabang. It's a magical and captivating place with stunning colonial architecture, ornate monasteries and colourful markets. Rise early to witness the ancient dawn ritual of saffron robed monks collecting alms, discover the hundreds of Buddha sculptures in Pak Ou Caves, see the spectacular Kuang Si Waterfall and climb Phou Si hill to watch the sun sink slowly behind the Mekong River. Luang Prabang has many great cafes and restaurants and also night food stalls which emerge at dusk. Ask your guide for personal recommendations. Itinerary Option: If you’re arriving to Luang Prabang in the morning, discuss additional day 1 activities with our staff. Wake before dawn to witness the offering of alms to the hundreds of saffron robed monks who walk barefoot through the streets of Luang Prabang carrying their begging bowls. This early morning ritual of monks leaving their monasteries to accept alms from the Buddhist devotees dates back generations. The ceremony enables the monks to demonstrate their vows of poverty and humility, and for the Lao people to gain spiritual merit by their charity. It is an inspiring sight that you are unlikely to forget. Watch the town as it comes to life before returning to your hotel for breakfast. You have the opportunity to participate by offering sticky rice balls to the monks. Please let your guide know so that they can organise the offering the day before. After breakfast accompanied by your guide to the Royal Palace, now the National Museum. The former Royal Palace was built in 1904 and framed by an avenue of Palmyra palms, blending traditional Lao with French styles. The museum houses precious exhibits that used to be possessions of the Laos royal family. The royal family’s former residential quarters have been preserved as they were when the king departed in 1975. The royal palace car collection is displayed in a separate outbuilding. 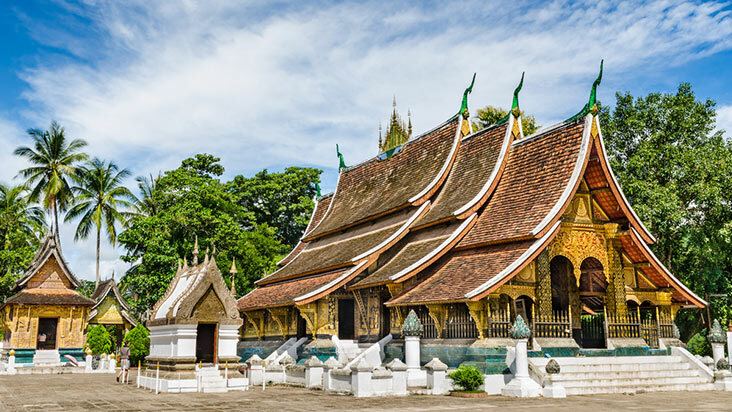 Then explore the main Buddhist temples of Luang Prabang including Wat Visoun, the most historically important temple, built in the 16th century and serving as a small museum for religious artefacts. Visit Wat That Luang, traditionally the cremation site for Lao royalty and housing the ashes of King Sisavang Vong and his brother, interred inside the large stupa erected in 1910. Wat Xieng Thong is a 16th century temple that epitomises the elegance and grace of Luang Prabang architecture and showcases classic Lao style roofs. This temple was one of only two temples that were spared by the Black Flag army in 1887, and it was then used as the leader’s headquarters during the invasion. 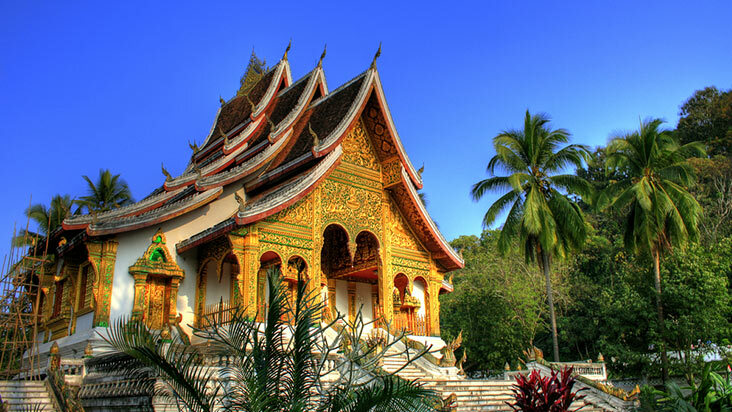 Wat Mai, beside the Royal Palace, is Luang Prabang’s oldest Pagoda, and one of the city’s most sumptuous monasteries. 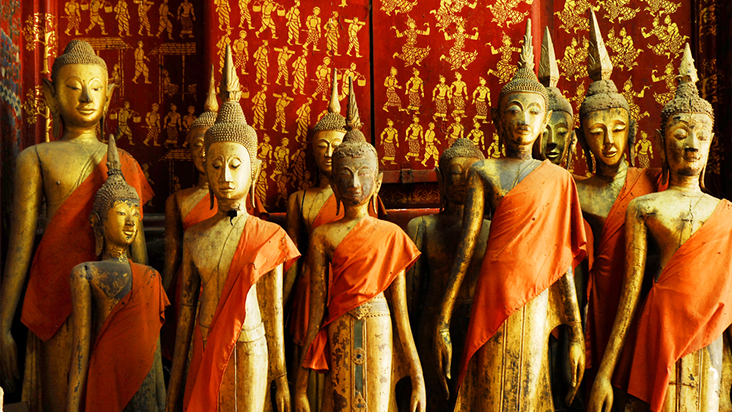 Wander around the fascinating Traditional Arts and Ethnology Centre and learn more about the people of Laos. On display you will find valuable artefacts, traditional clothing and implements from each of the twenty ethnic minority groups that inhabit the Luang Prabang area. The day ends with a climb to the top of Mount Phousi. The 100 metre (328 feet) hill is crowned by a gilded stupa, That Chomsi, which dominates the old city centre. Enjoy the wonderful views of the town, across the Mekong and Khan rivers, as well as the surrounding mountains. Watch the sun sink slowly behind the Mekong River before strolling back to your hotel. 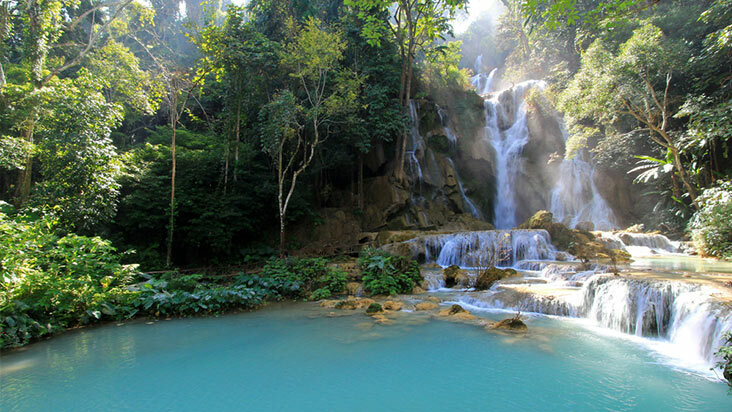 This morning set off with your guide to one of Luang Prabang’s most impressive and picturesque waterfalls, Tat Kuang Si. On the way stop off at Phosy market where you can observe locals trading in fresh produce. Across the street is Ock Pop Tock weaving centre which produces its own naturally dyed Lao silk and cotton textiles. Kuang Si is a multi-tiered waterfall, the falls beginning in shallow pools on top of a steep hillside, with the various cascades falling into clear turquoise pools. Walk through the National Park to the waterfalls and if you're feeling energetic, climb to their source and go for a swim. After a picnic lunch in the tranquil surroundings of the park, return to Luang Prabang. After lunch, with your guide, embark on a two hour Mekong River cruise to visit the mysterious and sacred Pak Ou Caves. As you journey by long-tail boat, typical Laotian villages are barely visible behind thick foliage. Wooden canoes attached to bamboo poles bob by the shore while floats mark the location of fishing nets. The Pak Ou Caves are dramatically located in a limestone rock formation opposite the mouth of the Mekong and Nam Ou rivers. The sanctuaries of Pak Ou consist of two large caves cut into the limestone cliff, revealing hundreds of Buddha effigies of various sizes and styles, from the tiny to the colossal and spanning many centuries. From the caves continue to Ban Muang Keo village where you can see local weavers and whisky distillers honouring their ancient traditional crafts. Return to Luang Prabang by river. Extend your trip to Pak Ou caves with an overnight stay at Pakbeng and on to Houeixai, and then transfer to Chiang Rai in Thailand. Visit a museum to learn about the dangers still facing the people of Laos. Other options include hill tribe visits, cooking classes, farm visit with traditional agriculture demonstrations, elephant rides and bamboo raft trips, elephant mahout experience, cycling and kayaking trips. Lunch and dinner as indicated on trip notes. We do not include lunch and dinner where it is practical for you to make your own choices, as we find that GetAboutAsia customers prefer the freedom of eating what they want, which is one the of joys of travelling.